JFrog Artifactory sits at the core of development ecosystems and is therefore, a mission-critical resource for developers and DevOps in any organization that develops software. As an organization scales, developers and DevOps tend to get bogged down with a common set of issues configuring and managing their binary artifact workflow in multiple Artifactory instances around the world. JFrog Mission Control addresses these issues by enabling enterprises to monitor and manage globally distributed instances of Artifactory in a single application. The Mission Control dashboard provides full visibility into the basic system health of all Artifactory instances at a glance, both as a grid and on a map. Clicking on any instance lets the administrator drill down and investigate it in greater detail. JFrog Mission Control uses configuration scripts which embrace a “configuration as code” approach to managing Artifactory instances. Configuration scripts are reusable pieces of code that can be applied to multiple Artifactory instances simultaneously while allowing customization per instance as needed. They facilitate automation through REST API, promote reliability by replacing repeated manual configuration and enable enforcement of standards and consistency while allowing any degree of customization. The Mission Control Instance Browser provides easy access to information on all managed instances. Selecting an instance exposes general information as well as details on repositories, system, license and HA status. A graphical representation of all replications and proxy relationships that the instance is involved in makes it easy to see how artifacts are flowing between the managed instances. JFrog Mission Control Monitor module provides online/offline status of all managed instances. Clicking on any instance exposes diagnostic information to help resolve issues it may be experiencing. This includes JVM parameters, memory usage, storage information, replication schedules and even data on Artifactory tasks running under-the-hood. JFrog Mission Control offers a REST API to automate everything from managing instances and repositories to managing users, groups, and permissions. 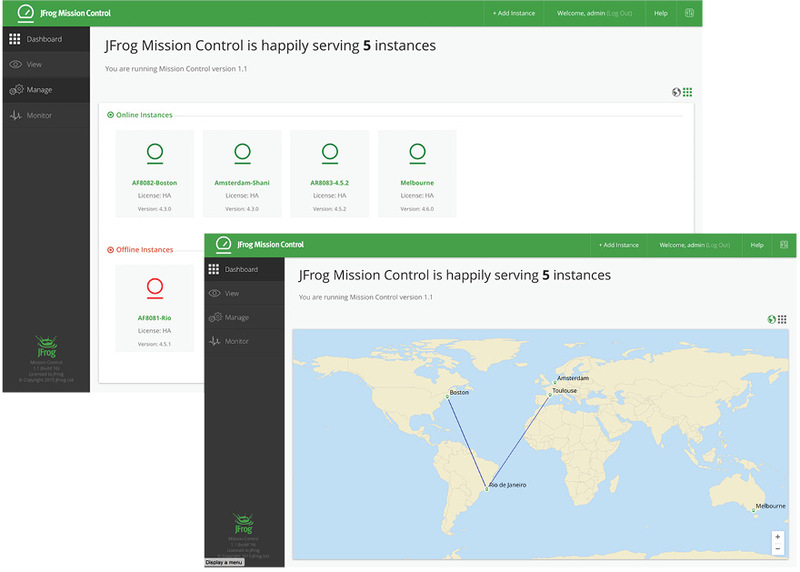 JFrog Mission Control helps organizations deliver software faster by providing centralized control, management, and monitoring of all of their Artifactory instances globally, giving IT and Ops leaders real-time visibility into their worldwide development, distribution and consumption of software packages. Ensuring highly reliable storage of, and access to, artifacts. JFrog Mission Control addresses these issues by enabling enterprises to monitor and manage globally distributed instances of Artifactory in a single application. With the thousands of binaries that often go into a software release and the explosion in binary artifact types,monitoring and managing each Artifactory instance separately has become a huge challenge. 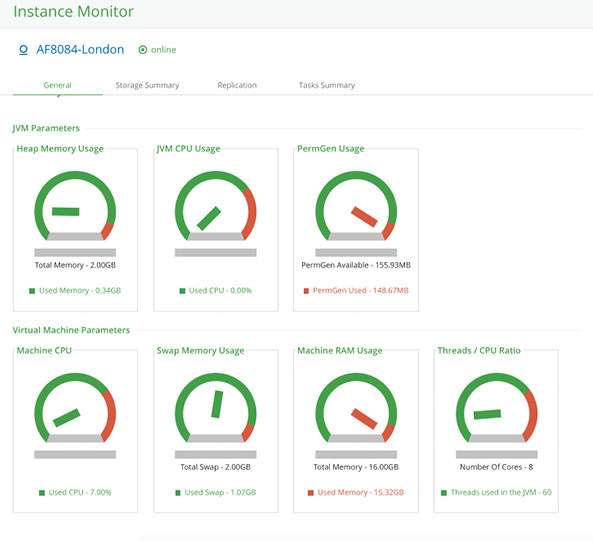 JFrog Mission Control offers a unique solution that saves time and effort with a unified dashboard and centralized control of multiple globally distributed instances of Artifactory. IT and Ops personnel responsible for managing multiple instances of Artifactory that serve missioncritical projects need to ensure that all systems are up and running at all times. Any downtime in an Artifactory instance can mean that development operations can grind to a halt. Therefore, an administrator needs an instant picture of all Artifactory instances in the organization to make sure they are all running smoothly. The Mission Control Dashboard provides full visibility into the basic system health of all Artifactory instances at a glance. Grid view instantly shows you which instances are running and which are offline as well as their name, license, and version for easy identification. The geo-location map adds a geographic dimension showing the global network of Artifactory instances along with their replication relationships. In both views, the administrator managing the global Artifactory instances can click on any instance on the dashboard to drill down and investigate it in greater detail. Configuration scripts improve your efficiency by enabling you to automate your Artifactory configuration tasks. At the click of a button, or through REST API calls, an Artifactory instance, and its repositories may be configured to any degree of complexity. Developing configuration scripts in a DSL designed for Artifactory configuration is also easier than developing proprietary scripts. Configuration scripts are reusable and can simultaneously be applied to multiple Artifactory instances that may also be running on different runtime environments (development, staging, production). Since configuration scripts circumvent the need to perform repetitive and error-prone manual actions, they improve the reliability of your configuration tasks. Configuration scripts can be used to enforce standards for repository names, include/exclude patterns, caching policies and more. Moreover, scripts are a vehicle to replicate the configuration of one Artifactory instance in another. 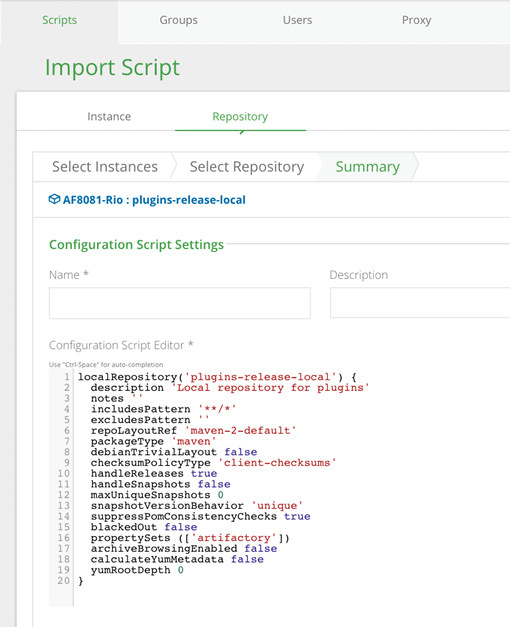 Mission Control can import the configuration of any Artifactory instance that is already set up into a configuration script, and then apply it to any other instance thereby replicating the configuration of the source instance in the target instance. While scripts are a way to standardize configuration across multiple Artifactory instances, they can also be customized with user input when being applied, thus providing the flexibility to adjust how any particular instance of Artifactory is configured. General: General information including online status, location, version, and a clickable URL allowing the administrator to log on to the Artifactory instance directly. Repositories: A full list of repositories including the number and type of artifacts it hosts. Connections: The Connections tab provides a graphical representation of the replication and proxy relationships that the selected Artifactory instance has with others. This is the clearest picture of an organization’s global binary workflow that a DevOps administrator can get when working with different multi-site topologies. System Info: A full set of system properties and environment variables set for the selected Artifactory instance. License: Information on the license with which the Artifactory instance is activated including its owner organization, status, validity, type and hash value. HA: Information related to the HA configuration of the Artifactory instance including its ID, URL, last heartbeat, running state and role in the cluster. General: Shows a series of gauges that display visual information about the Artifactory instance’s JVM parameters and about the container in which it is running. Storage Summary: Information about the number of binaries and the storage volume they occupy. Replication: Information about all replications in which the selected Artifactory instance is involved. Task Summary: Displays information on all running tasks. This information can be used for advanced analysis of events or issues that may occur in the selected instance. Automation is key to any administrator who has to deal with scale, and JFrog Mission Control REST API takes automation to the next level with endpoints for creating, listing and updating everything from instances and repositories, to users, groups and permissions. The extensive REST API enables automation of virtually every task that an Artifactory administrator may need to perform by applying configuration scripts in much the same way that the administrator would do using the UI. To support flexible standardization, the REST API accommodates scripts with variables that require user input thus allowing automated customization of Artifactory instances. As companies scramble to deliver software faster, they share the pain of moving to modular software architecture to automate their continuous delivery pipeline. 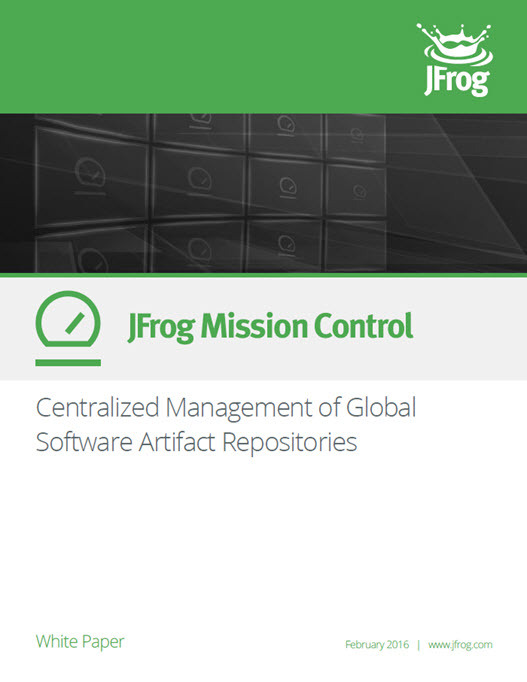 JFrog Mission Control greases the wheels of automation by providing enterprises with centralized control, management, and monitoring of all their Artifactory instances globally, giving IT and Ops leaders real-time visibility into their worldwide development, distribution and consumption of software packages. The latest version of Mission Control is freely available for download from the Mission Control Download Page. To get started using Mission Control, please visit the Mission Control User Guide.